Small amounts of fungal spores can be found on the skin of healthy humans and animals. An overgrowth of fungus can cause infections and dry skin. Fungal infections and bacterial infections may be found at the same time. The organisms colonize the keratin tissues, and inflammation is caused by host response to metabolic by-products. These infections are known as ringworm or tinea, in association with the infected body part. Quilling is a prime time for fungal overgrowth and infection. Already dry skin makes hedgehogs more susceptible to bacterial and fungal infections. Fungal infections are often treated with either homeopathic methods, over the counter creams and/or shampoos, or prescription medications. If a hedgehog has a fungal infection, it might be best to check other animals or humans that came in contact with the animal. Fungal spores travel easily through the air making transmission quite simple. This yeast infection is referred to as Malassezia. This fungus can also cause ringworm. It is contagious and will spread on contact. 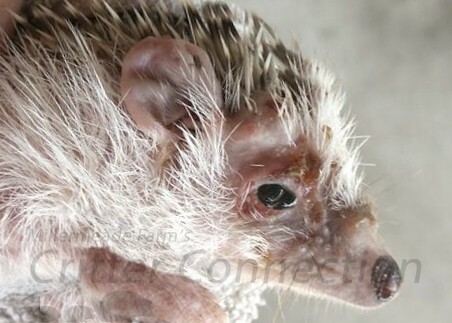 The best way to determine if your hedgehog has a fungal infection is to go to your exotic veterinarian. Your veterinarian may do a skin scrape to see if there are any mites, but many veterinarians and owners prefer to treat for mites first as a precautionary measure. Revolution for hedgehogs is very cost effective, safe, and is more reliable than the actual test for mites. If the hedgie still has dry skin after the Revolution treatment, you’ll want to have your vet test for fungal infections. Veterinary treatment is absolutely necessary when simple home remedies do not take care of the problem. Both oral antibiotics and external fungal treatment may be prescribed. Veterinarians should NOT prescribe oral antibiotics and oral fungal medications at the same time. Change bedding and wash all fabric within the cage, as well as thoroughly clean the cage regularly for up to a week after the infection is gone. According to Earl Mindell, author of “Dr. Earl Mindell’s Amazing Apple Cider Vinegar,” vinegar is capable of killing fungus and bacteria, especially when applied to the affected area repeatedly. Therefore, it is a helpful topical scalp fungus treatment. This is also helpful for treating dry skin and reducing dandruff, not caused by fungus. Leave the mixed solution on scalp for about one minute before rinsing away in water. Repeat this again if the infection is severe enough. Avoid getting the solution in the eyes as it may cause stinging. You do not need large amounts of the concoction, only small amounts… just enough to get it to the scalp. Because the vinegar is mixed with water, it should be generally mild and harmless to the skin. Even so, it can burn your eyes, so keep it away from this area and apply it in a well-ventilated space. You should see a reduction in irritation and dry skin within a week, and it should clear up within a month, according to White and Foster. If the fungus still doesn’t dissipate, see a doctor for medicated shampoos and other treatments. If the fungus hasn’t cleared up within a few weeks or gets worse, see a doctor for a stronger course of treatment. Simply dissolve the borax in water. Use ½ to 2/3 cup per gallon (too much will leave borax crystals in the bottom of the jug) Soak your hair in it and shampoo into the scalp. I leave it in while I shower, and then rinse it out. I have been following that with the ACV / H202 solution that TED recommends and rinse again. I may discontinue the ACV rinse, but so far I haven’t wanted to mess with a good thing. It is widely used in hospitals, veterinary clinics, and dental products/clinics, and even some Goodwill Stores. Used in many human health care products. Chlorhexidine can kill a variety of pathogens. It is ineffective against parasites so a separate treatment for mites is required. It is often used to treat bacterial skin infections. Get a small ice cream bucket or other small bucket and make the solution (as directed on the label) and soak your hedgie. I put enough warm water in the bucket so the hedgie has to keep nose out of the water. Soak back and legs but avoid ears and nose. Repeat daily for two weeks. I’ve had customers who work in all these places plus one customer used it at Goodwill where they worked. Another customer works for the Purell Company and they make wipes for elderly skin care the same as I make wipes with Bounty. http://en.wikipedia.org/wiki/Ketoconazole 7/27/12 Ketoconazole is usually prescribed for topical infections such as athlete’s foot, ringworm, candidiasis (yeast infection or thrush), and jock itch. The over-the-counter shampoo version can also be used as a body wash for the treatment of tinea versicolor. Ketoconazole is used to treat eumycetoma, the fungal form of mycetoma. The patented Malaseb® formula is powerful enough to help combat dermatological fungal and bacterial infections, and gentle enough to preserve and condition the hair coat of dogs and horses. In an evidence-based systematic review, the only topical formulation recommended for the management of Malassezia dermatitis is 2% Miconazole Nitrate with 2% Chlorihexidine Gluconate. FREE FROM DYES AND PERFUMES – Some dog shampoos contain harsh dyes or perfumes that can make the original problem worse. Malaseb® Medicated Shampoo is free from both dyes and perfumes to avoid further exacerbation of sensitive skin issues. DESCALES AND DEGREASES THE COAT WITHOUT STRIPPING – Malaseb® uses a surfactant base to remove damaged lipids from the skin and simultaneously conditions the coat to retain moisture. This helps to ensure your pet’s coat is healthy and luxurious — just the way you both want it. CONOFITE (miconazole nitrate) Spray or Lotion® is a synthetic antifungal agent for use on dogs and cats. It contains 1.15% miconazole nitrate (equivalent to 1% miconazole base by weight), polyethylene glycol 400, and ethyl alcohol 55%. CONOFITE (miconazole nitrate) Spray or Lotion is indicated for the treatment of fungal infections in dogs and cats, caused by Microsporum canis, Microsporum gypseum and Trichophyton mentagrophytes. Consistent ringworm treatment with Blue Star Ointment usually clears up the fungal infection in just three days. However, continued ringworm treatment is recommended for up to a week after the skin is clear to prevent relapse. Sulfur has long been used by dermatologists because it possesses antifungal, antibacterial, and keratolytic properties that are effective in killing hair follicle infections. Be cautious of products containing zinc oxide or tea tree oil, even though tee tree oil also is an antifungal agent. Veterinarians Karen A. Moriello, from the School of Veterinary Medicine at the University of Wisconsin-Madison, and Susan Newbury, director of Animal Medical Services at the Dane County Humane Society, recommend the lime-sulfur dip as a cost-effective and safe treatment, even for young cats. Light gray to creamy colored “finger-like” growth that begins over the edges of the ears. Flaky in structure on the ears and will fray off at the edge. Many bedding products contain fungus. Over the counter athlete’s foot cream can treat mild cases. Clortimazole topical drops or other fungicidal applications administered twice a day until the fungus falls off the ear. Veterinarians can determine the damage done by the fungus, and check the ear internally to be sure no damage has been done. All fungicides must stay out of the hedgehogs’ eyes. Some veterinarians recommend that you rub Betadine on the ears.